Do you have a Shop Policy? Yep! Check out No Love Lost's Policy. What is the Shop Rate? Check out No Love Lost's Shop Rate. Immediate Care: Upon completion of your tattoo, the artist will apply a SANIDERM bandage. Please keep your tattoo bandaged for 8-24 hours, depending on how much your tattoo weeps. It is normal for blood and fluid to collect under the bandage. To remove: start at a corner, slowly and gently peel the bandage downwards against your skin, do not pull outward away from your skin. It is often easier to remove the bandage in the shower and use warm water to help loosen the adhesive. When you remove the bandage, wash the tattooed area immediately with warm water and our No Love Lost soothing all natural foaming cleanser. Use clean hands to lather the area and thoroughly remove all blood and bodily fluids from your fresh tattoo. DO NOT use a wash cloth! Pat tattoo dry with a clean towel or paper towel. Leave uncovered to breathe until fully dry. DO NOT MOISTURIZE YOUR TATTOO AT THIS STAGE! Once dry, apply the second application of SANIDERM you were sent home with. To Apply: peel off paper backing to expose adhesive side, gently apply bandage using light pressure and make sure there is at least one inch to be in contact with undamaged skin, make sure your skin is in a neutral position and you do not stretch the bandage while applying. Remove plastic backing at the perforation leaving only the SANIDERM on the skin. This Second Application can now stay on for 2 to 4 days. Daily Maintenance: You can shower and perform normal daily tasks with this bandage. When you remove this second application, wash well with the cleanser and pat dry. Your tattoo will now be mostly healed. Make sure you change your bed sheets prior to sleeping with your new tattoo. After both applications of the SANIDERM have been removed, you will begin to notice your tattooed skin is drying out/ becoming tight. At this point you will want to use clean hands to apply a thin layer of our No Love Lost All Natural Aftercare ointment to the tattooed area. DO NOT over moisturize! It is recommended that you apply this ointment to the area whenever you notice that it is dry. Keep this routine until your skin has fully healed. What to expect: A healing tattoo may be mildly tender for a few days. It may be accompanied by body fluids collecting under the bandage and light swelling. If you develop a rash, irritation or notice excessive redness, swelling, soreness or oozing after several days of receiving your tattoo, please contact the artist. If there are any serious complications within 24hours please contact your family physician. The normal healing process is about 7- 14 days for full healing. Long Term Care: Tattoos fade slightly with age. To protect the longevity of your tattoo, first, make sure that it heals correctly. Secondly, protect your skin from the sun by using at least SPF 50 sunscreen. Third, just be good to your body! Drink enough water and moisturize your skin daily. Wednesdays 6-7pm at our Studio at 98 King St. W in Bowmanville. All Consultations are free of charge! Consultations give you the chance to discuss your ideas with an Artist. A consultation can also give you a better idea of the cost of your Tattoo and the time needed to complete your Tattoo. 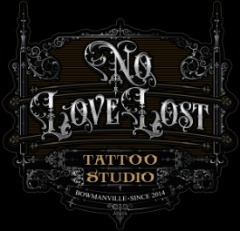 If you wish to book an appointment or be placed on the waiting List at No Love Lost Tattoos Bowmanville, You must pay a $100 deposit. Please remember, your deposit is NON REFUNDABLE and will be applied to the cost of your Tattoo, upon completion. At No Love Lost Tattoos in Durham Region, we require at LEAST 72 Hours notice for any Cancellations. If proper notice is not given to cancel an appointment, You will forfeit your deposit and be charged 20% of the booked appointment time. Rates are set according to each individual artist. Please visit each artist's bio page to learn more about their rates. All Payments can be made by cash, debit or credit. When do I get to see my Design? Usually the day or two before your scheduled appointment. No, we don't draw before bookings and No we won't send it to you a month before. Our artists do so many tattoos, to have YOUR design fresh in their mind they draw the tattoo as close to your appointment as possible. This allows less distraction and a fresh perspective when tattooing it onto you. Too bad so sad! Just kidding. Minor changes are free. REDRAWS or change of concept are charged an extra hourly rate and are done during your appointment time, which may require you to book further appointments to finish your tattoo.